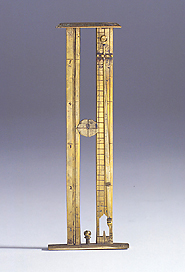 The instrument, provided with a rigid plummet, is made up of two parallel brass plates between which a pinhole sighting plate can slide. The instrument would have had a curved base which is now missing, as are other parts. This type of instrument, known as a cannoneer's rule or bomber's rule was used to indicate the elevation of guns, by placing the curved base on the rear of the cannon. The optimum elevation was determined by taking the density of the projectile into account.